Hundreds of tourists will have to rebook hotels today after India’s highest court imposed a buffer zone around tiger reserves, a decision that is a win for conservationists and a loss for one sector of India’s tourism industry. India’s top court banned tourism in tiger reserves across the country on Tuesday in a ruling that aims to protect the endangered big cats but may disrupt travel plans for droves of tourists. 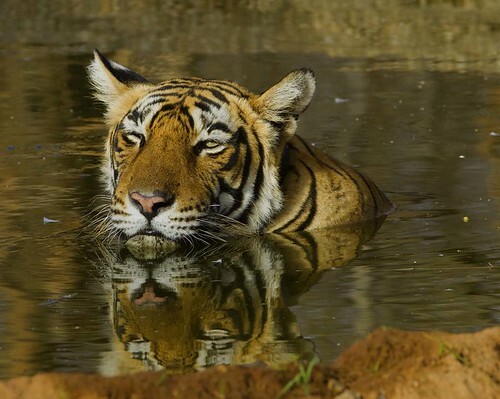 The Supreme Court also announced stiff penalties on Indian states that have not created buffer zones around tiger habitats, said Wasim Kadri, a lawyer with the National Tiger Conservation Authority. Ranthambhore Tiger Reserve in Rajasthan, India. Photo by Koshy Koshy. The court fined six states for failing to declare buffer zones around tiger reserve forests and gave officials three weeks to act on its orders. India is home to more than half of the world’s estimated 3,200 tigers, with most of them living in wildlife reserves set up since the 1970s. Hundreds of hotels and shops operate inside the tiger reserves to cater to wildlife-watching tourists. The court said the ban was temporary, pending its final judgment on a case filed by a wildlife activist demanding that all commercial activity be banned from the core area of the reserve forests where the tigers live. Conservationist Ajay Dube had complained to the court that authorities in several states had allowed the construction of hotels, wildlife resorts and shops in the core areas of the forest reserves. He told the court that critical tiger habitats should be kept safe from all types of human disturbances, including tourism. In April, the court had ordered eight states to declare buffer zones around the tiger reserves within three months. Only two states had complied with the court ruling, prompting the judges to impose a fine on the remaining six. The ban on tourism in the “core” tiger habitat areas of the reserves set off protests from tour and travel operators who say stopping tourism will encourage illegal wildlife trafficking as poachers will not be hindered by the presence of tourists. Travel Operators for Tigers, a travel trade grouping, said tigers were safer in reserves that were visited by large numbers of tourists. “The highest densities of tigers can be found today in the most heavily visited tiger reserves,” said a statement from the group. “Unseen and unloved” wildlife sanctuaries and forests lost all their tigers and wildlife to poaching, grazing and neglect, it said. The ban on hotels in the core areas of the tiger reserves will hit the holiday plans of hundreds of tourists who have booked rooms to stay in the forest. They will have to move to hotels and resorts outside the reserves.